Zaption is a tool for creating video-based quizzes. Unlike some services like TED-Ed that have students watch a video then answer questions at the end, Zaption allows you to display questions for students to answer as they watch a video. To create a quiz on Zaption you start by creating a "tour" in your account. A tour is a combination of videos, images, and text arranged into a sequence. Back in April Jennifer Carey wrote a great overview of using Zaption in the classroom. Yesterday, Zaption announced a new feature in beta testing. That feature is called Zaption Presenter. 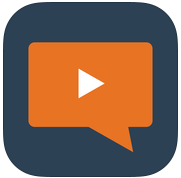 Zaption Presenter will let you present a video in the front of the room and or stream it to your students' devices. Your students will be able to use Zaption Presenter ask questions directly from their devices while the video plays. Teachers can add questions to the presentations on the fly and have those questions appear on students' devices. Zaption Presenter is still in a closed beta period. If you're interested in trying it, you can sign-up here for early access.